Wairarapa College student Emily Masters was able to realise her dreams of becoming a vet last week – even if it was just for a day. 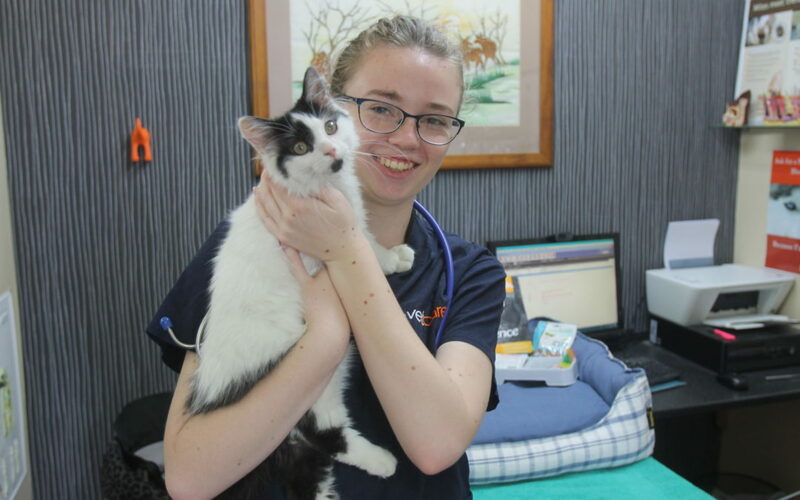 She was selected as Vetcare’s first Young Vet for the Day and worked alongside veterinary staff to assist in the care of all sorts of welfare pets. In the morning of last week’s placement, Emily observed 24 patients, including rehabilitation patients having laser therapy, routine surgical desexing, finding and removing a tick, renal failure, routine puppy and kitten checks, and vaccinations. Emily said she had wanted to become a vet for some time after being surrounded by cats and dogs. Her family own four cats, a dog, five cows, and more than 30 sheep. Vetcare owner Dr Heidi Ward-McGrath said the more animals that young people were exposed to when they were younger, the better. She said the Young Vet for the Day initiative was all about “planting seeds” for the future of the veterinary profession. “We want these talented young people to care for the pets in our community. The placement was open to anyone from 15 to 18 and, as the successful applicant, Emily was gifted a pet care pack valued at $70.